(Nanowerk News) Lithium-sulfur batteries have been a hot topic in battery research because of their ability to produce up to 10 times more energy than conventional batteries, which means they hold great promise for applications in energy-demanding electric vehicles. 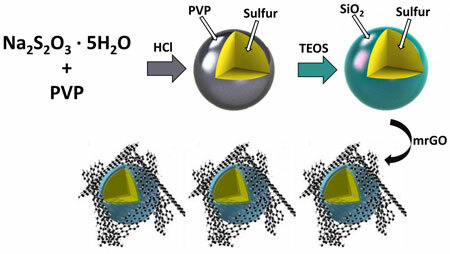 The work is outlined in a paper, "SiO2 - Coated Sulfur Particles as a Cathode Material for Lithium-Sulfur Batteries", just published online in the journal Nanoscale. In addition, the researchers have been invited to submit their work for publication in the Graphene-based Energy Devices special themed issue in RSC Nanoscale.